A McCormick “tractor binder” manufactured in Canada and apparently dating from the early 1920s( research is still ongoing) has just been acquired from a local collection. It is an 8 feet cut model. This machine originated in Bucknall Lincs and has been in the collection for many years but is now surplus to their requirements. This machine differs from our Massey Harris binder in that it is specifically designed for use with a tractor( rather than horses) being powered by the tractor “power take off” rather than the Land (Bull) Wheel on a horse drawn machine. The machine is basically very sound but the engine has suffered from exposure to the elements. Both replacement cylinder head and petrol tank have had to been purchased. Grant has made and fitted a repair section to the air-cooling cowling which had rotted away. Luckily the engine was not seized, but Tony Hogg has had to refurbish and regrind the valves. He has also rebuilt the magneto and carburetor using spare parts we had in stock. We will need to make a new engine drive belt. Most of the hard wood slats have now been unbolted, and after being allowed to dry out, will be cleaned up and replaced where necessary. The drive chains have freed up nicely after the liberal application of waste oil. A 2 wheel tip cart has been donated to the Museum by Mr Anthony Brown of Bag Enderby and was moved to Alford at the beginning of December. It bears Mr Brown’s family name and was last painted in 1947. It seems that it has been worked on by Messrs Cawthorpe of Ulceby sometime in the past. This type of cart was once in widespread use both on local farms and nationally. Many , like this example, were converted to pneumatic tyres for tractor operation, after the war. This extended their working lives well into the 1960s, when the original wooden wheels became unserviceable. It has suffered some minor damage, caused by a barn collapsing around it, whilst in storage. A Cooks elevator dating from the mid 1950s fetched today from the farm of William Sergeant at Stragglethorpe near Newark. We just went to fetch the elevator but were given the sack lifter as well by a neighbour! We moved the machine outside on 19th October, refitted the radiator screen and tested the reassembled reel assembly. We then gave the machinery a good “run” to remove all the crop debris from the threshing day, and put it back to bed for the winter! We are very close now to finally finishing the restoration, which started on November 1st 2014 when the machine was moved to the Museum of Rural Life! Museum of Rural Life September 2018 update. Grant has been on his knees welding in the repair panels I made for the table floor of the combine! The new metal work was painted and then the auger, having been fitted with new end bearings, was replaced and repainted. Grant had previously managed to remove the troublesome auger casting and using the similar part from our donor combine, produced a fully rebuilt part to refit. The reel has now been refitted. The driving wheels from the donor combine and the steering wheels from our machine have had their old tyres removed and been shot blasted and primed by Gordon Smith. They have since been repainted in the correct colour, fitted with new tyres and have now been refitted to the machine. Mick Dale has repaired and restored the wooden sails of the sail reaper and treated them with wood preservative. We hope to work on this machine further over the winter. Vintage Tractor Run and Steam Threshing Day. 17 tractors took part in the Vintage Tractor Run on a cool cloudy morning, which turned showery for the last 30 minutes. All the participants seemed to thoroughly enjoy themselves! The steam engines and steam lorry arrived in the afternoon, followed by the baler and Marshall tractor. The engines, baler, elevator and threshing drum were all positioned and levelled ready for Sunday. We had a very good attendance of visiting Stationary Engines, which together with several of our own operated by Tony , made an excellent display. Sunday dawned dry and fine for the Steam Threshing day, which was a great relief! The drum, elevator and baler ran very well. A start was made shortly after 11.00 and all the sheaves were threshed by 3.30, with a break for lunch, yielding about 2 tonnes of wheat, and a good trailer load of baled straw. The opportunity was taken to feed a few sheaves manually into the combine as we hadn’t managed to get it to a field of wheat. We were delighted that it worked perfectly and a good sample of threshed wheat was collected! Our hard work on the extensive rebuild has not been in vain! Phil Langdale, the son of the last owner of the machine, arrived to see it run, and has donated the operators manuals that his father had for the machine. He has also loaned us a 35mm transparency of it at work in 1972 with his father driving, for digital copying. Members of the Pre War Austin Seven club visited and spent the day with us, making an interesting and varied display with their cars. Mr Crust brought his fascinating collection of historic drainage hand tools, and Robert his collection of bicycles. Video courtesy of Paul Read – Rigsby Farming Co. The wheat harvest is very early this year, and we completed ours on August 4th! James Howe very generously allowed us access to one of his wheat fields, and without his help it would be much more difficult to organize our harvest. Andrew Willoughby was busy the previous morning moving the trailers down to the field with his International tractor, and on harvest day towed the binder to the field. We took the Fordson along and Alec and Grant brought their tractors too. Having assembled the binder, we made a start shortly after 10 o clock and because the crop was so heavy, had a few initial problems with the knotter. With Brian’s expertise we managed to set the machine up to cope with the conditions, and it then ran very well. Andrew drove the tractor, using firstly the Fordson until it stalled and wouldn’t restart! We then used Grant’s Ferguson and then Andrew’s own tractor, and finally finishing off the last few sheaves with the Fordson. The Fordson was on its best behavior as it towed the binder back home to the barn. Richard Willoughby and Brian loaded the trailers with everyone else taking a turn at pitching the sheaves. We finished with two very good loads of sheaves which are now stored in Bill’s barn ready for the Steam threshing day on September 9th. The Museum volunteers and friends went home tired but happy having successfully carried out a vintage harvesting operation in idyllic conditions on a perfect summer’s day. Ashley Vincent, August 5th 2018 – pics to follow shortly. The Steam Working Day took place on Sunday 8th July on a very hot day. Harold and Gordon brought their two engines and the Field Marshall tractor. Mark and William brought the newly rebuilt Steam Roller in a temporary pink livery. It will be painted like this throughout 2018 to raise money for breast cancer research. Mark and William also brought their saw bench and a plentiful supply of wood. Harold’s tractor powered the saw bench and gradually reduced the wood into firewood! Tony displayed four of our Petter and Lister Stationary Engines at work. We erected the Maldon elevator, powered by our original Petter engine, and demonstrated this several times. The Binder was displayed and we moved the Combine out of the shelter so that it could be shown working in its rebuilt form. We also had some visiting tractors and cars. There was a steady flow of interested visitors throughout the day enjoying the spectacle on a lovely sunny day in beautiful surroundings much to the benefit of the Museum and the Manor House. Grant has been on his knees welding in the first of the repair panels I made for the table floor of the combine! Once he has welded in the other smaller panel, we can replace the auger and build up the rest of the header, finishing with the reel. Grant has also been busy working on the troublesome auger casting, and eventually managed to remove it and the similar part from our donor combine, so that we now have a fully rebuilt part to refit. The Ruston engine is now working well again after sulking! The injector was tested and found to be in perfect working order, and after Tony replaced it and fitted some new gaskets, it now runs quite happily, if a little smokily, again! It is planned to overhaul it this winter and reduce the oil consumption. After several weeks of frustration because of the difficulty in removing a casting, we finally managed to disconnect and remove the front auger from the combine! We can now begin the job of repairing the corroded sheet metal in the floor of the “table”, and have ordered some suitable mild sheet from Brundles. The combine project has been featured in the “news” section of a new magazine entitled “Heritage Tractor” after its Managing Editor, Rory Day, visited the Museum on the early May Bank Holiday. This in turn has enabled us to make contact with a Vintage Agricultural machinery collector in Saltfleetby who has now supplied us with new, old stock, cutting knives for both the combine and the binder! This is a significant step forward the restoration progress. Mick Dale has taken the wooden sails from the Edlington Sail Reaper back to his workshop, to begin the repair and restoration process. Rory Day, who is also an avid collector of Vintage Agricultural Machinery literature, has sent me some scans of contemporary Edlington literature. In addition, Mrs Sue Edlington, from the company which still manufactures Agricultural Machinery, has sent me photo copies of an original Parts List, from her archive. As a result of this we now know that this machine was originally produced from 1890 and it is a “ New Patent X.L. Self Delivery Reaper”. The description of the machine states that it is “ a Reaper strong enough to handle the heaviest crops, yet within the power of two light horses” It also states that “ When fitted with our Patent Pea Lifters and set to allow every rake to sweep the platform this Reaper will cut peas better than any other machine yet brought out”. It is interesting to note that we have a set of these lifters ( available at the time for £1 15 0 per set) and that the last job the machine was used for was cutting peas! The price of the machine new was £28 0 0. Good progress continues to be made with the combine restoration project in 2018! The replacement grain pan, which we made last year has, at last, been fitted, and this enabled the repaired rear hood to go back on. It was removed from the back of the binder shed, where it has been stored since last July, and was sanded down and the replaced metal sheet painted with primer and top coat. We managed to lift it back onto the machine, by hand using our two sack lifters, one each side, and it was then gently slid forward onto the framework. Getting all the bolts back into their respective holes was a little challenging, but it has been achieved successfully! It now looks like a combine again. The straw walkers were then lifted back into position and bolted up. The canvas curtain at the back was missing, when we acquired the machine, so the fittings were removed from our donor combine. This enabled us to make and attach a replacement curtain. The back of the machine has now been completely reassembled with some missing parts replaced and apart from some minor adjustments is fully functional for the first time. Painting of the rear of the machine is almost completed and new decals have been ordered. Work has also taken place on the transmission, using spare parts from the donor combine, to enable the machine to be manoeuvered using its own motive power. Subsequently, in late April we were able to reverse it from the shelter, turn it round and reverse it back in to allow access to the front end. We have now removed the reel and started to remove the augur to enable some badly corroded sheet metal to be removed and replaced. The wooden sails from the sail reaper have been treated with preservative to eradicate woodworm. We haven’t had time to do any further work on it as yet. The Fordson tractor was serviced over the winter whilst in the barn, and has now been moved out in front of the binder for the summer. It is protected from the weather by a sheet. 2017 ended with an exciting new acquisition to our collection of artefacts! For some time we had been looking for a “missing link” in our collection of harvesting machinery, and in December we found it! It was amongst many old pieces of agricultural machinery, including our Ransomes Motrac plough, being disposed of following the death of a retired farmer and his wife. It is a Sail Reaper and was a successful means of mechanizing the cutting of corn(reaping) to eliminate the physically demanding manual effort of using a scythe or sickle. Our machine was manufactured by J P Edlington of Gainsborough and was supplied by an agent in Bourne. It has been on the same farm in Gosberton for many years, possibly since new and having been stored under cover, apart from some woodworm in the sails, is in good sound condition. It has five wooden sails that rotate pushing the corn cut by the knife onto the stubble in bunches. These bunches then have to be tied by hand to make sheaves ready for “stowking”. The Sail Reaper was eventually superceded by the Reaper Binder, whose design was perfected in the 1880s and both reaps and binds the sheaves automatically. Our own restored Binder is a Massey Harris No3 manufactured in Canada and dates from the late Victorian/early Edwardian era. Good progress has been with the combine restoration. The replacement side panels have been welded in at the rear of the machine by Mick Wilkinson and the repaired and refurbished “fanning mill” has been bolted back into position. The chassis has been cleaned of rust and debris and painted at the back whilst access has been good and the elevators have been temporarily refitted. We hope to refit the refurbished “shaker shoe” assembly before Christmas, which in turn will enable the new grain pan to go in. DK has fitted a replacement, original pattern, water temperature and oil pressure gauge to the engine. It is the same type as was also fitted to the Lotus Elan, so a boost to performance is predicted! It is very encouraging to see this machine now beginning to regain its former shape! 2017 was a very busy and rewarding year during which our collection expanded and improved due to the hard work of our devoted volunteers. We plan to continue the momentum throughout 2018. The Heritage Weekend is now long over, and was very successful. On Saturday the Vintage Tractor Run had a record attendance with 19 tractors taking part on a fine dry morning. At the Manor House other tractors were on display and there was a good attendance of visiting Stationary Engines. Tony Hogg was kept busy with our Ruston diesel, and several of the Lister D and Petter A1 engines. On Sunday our Hornsby threshing drum, driven by Gordon’s fine Marshall steam engine was used to thresh the sheaves made a month previously using our own Massey Harris binder. Our Maldon elevator was used to convey the threshed straw to the Jones wire tying baler, belonging to Harold and Gordon, and driven by the Clayton and Shuttleworth engine of Mark and William. This elevator worked very well and is the first occasion we’ve had to use it since acquiring it a year ago. The event ran very smoothly with no problems, thanks in part to a great deal of preparation in advance by the barn volunteers, and the fact that we now understand the machinery much better! We were fortunate that the rain held off until after tea time when the threshing was complete! The combine, despite its partially dismantled state, was demonstrated several times between sessions of threshing and created quite a lot of interest. Harold also brought along his 1907 very rare Foden steam lorry and his newly acquired Series 3 Marshall tractor to the event. Nine pre war Austins and their owners (members of the Pre War Austin 7 Club),on a pre arranged visit, spent the day at Alford Manor House on the Sunday and thoroughly enjoyed themselves. We hope they will come again next year. We are very grateful to Harold and Gordon Smith and Mark and William Riggall without whom the threshing event would not have been possible. Since the weekend we have acquired a Ransomes two furrow trailer plough at a very favourable price! This is for renovation, having stood outside for some considerable time ,and spent all its working life in the Gosberton area. Once restored ,we intend to use it behind the Fordson tractor. Work has now started again on the combine, and new panels are being fabricated at Mick Wilkinson’s workshop so that the back of the machine can be rebuilt. We really do hope we can get it all back together again for harvest 2018! Harvest happened at very short notice this afternoon. James Howe rang to say that the wheat was fit, and if we wanted some we needed to be there after lunch. Andrew Willoughby brought along his immaculate B414 and towed the binder to Ailby. Thomas and Alec towed the two harvest trailers to the field behind their Fergusons, and I drove our Fordson N to the field. We assembled the binder and made a start using Andrew’s tractor, as the Fordson had sulked and stopped! Tony Hogg eventually managed to get it to start by cleaning the magneto points, and it towed the binder very capably for the remainder of the afternoon. We had one glitch with the binder when the cam follower came undone, and jammed the works! Grant rushed back to his workshop and made an emergency repair which worked very well and we were able to complete both the trailer loads. The trailers are now safely stored under cover in Bill’s barn, and the tractor and binder are back at the Manor House. Our team of friends and volunteers worked tirelessly on a warm afternoon to provide some good dry sheaves for our forthcoming Vintage Steam Threshing day on September 10th. We are indebted to James Howe for generously allowing us access to his wheat field. Bill Read’s trailer overhaul is now almost complete and the new “gormers” have now been firmly attached using the iron work forged by Grant, and some welding by Mick Wilkinson. It has been repainted with Thomas Pink applying the finishing touches, and looks resplendent in green and black with red wheels. Robin has made up some much needed lighting and indicator boards for the trailers. The overhaul of the Maldon elevator is now completed with the addition of a new drive belt, and it has now been folded up sheeted down until needed in September. Our Fordson tractor is now fully “road legal” as we have now been allocated an “age related” number. It has also just been fitted with a belt drive pulley acquired from salvage centre near Peterborough. This will enable us to drive equipment such as the threshing machine when no steam engine is available. The binder has been fitted with “new” tyres to the road transport wheels. The previous tyres were showing their age, and a contact of Tony Hogg donated and fitted them free of charge. It is now ready to travel to the harvest field when the wheat is “fit”! We had a test run around the car park with the Fordson today! The repairs to the rear hood of the combine have now been completed as well as welding to the elevators and the shaker shoe. We are now removing the sides at the back of the machine. These are badly corroded and will serve as patterns for new ones, which once welded in will enable the machine to be reassembled at last! The restoration has proved to be a much bigger task than originally envisaged! We are extremely grateful to Harold Smith who helped us move the Huttoft combine to Bilsby last week. We had to use the rear wheels off our original combine as the Huttoft combine had no rear tyres. This machine will be a valuable source of spare parts in our restoration programme. Repairs to the Hornsby drum are almost complete. The woodwork has been repaired and repainted by Grant. He has also made a new metal shute linking the sieves to the elevator, and a new fan bearing, machined from solid brass by a local engineer, is ready for fitting. The machine should be in tip top condition for September 10th, our Steam Threshing Day! Mr Anthony Brown from Bag Enderby has donated a Russell precision seed drill, dating from the early twentieth century, and this has been moved to Alford, and put under cover in the cart shed. This will only need a little cleaning up and lubrication to return it to full working order. He has also donated a fine Lincolnshire waggon and a wooden tip cart fitted with pneumatic tyres. These are both lettered with his family name. Two of the wheels at least on the waggon will need attention to the “felloes”, and the cart has sustained some damage caused by a collapsing building. We have treated both of these with wood preservative. An interesting sack drier has been donated by Mrs Stennett , and this has been installed, complete with new cross pieces, in the barn. Mrs Stennett also donated various pieces of working horse harness which Brian Middleton has cleaned and beautifully restored. These will join the rest of our harness collection in the Blacksmith’s Shop. Bob Pick has made some very sturdy ramps to enable the threshing drum to be more easily set up for work in future threshing events. These will be invaluable, and we will no longer be dependent on borrowed ramps. Tony Hogg has managed to persuade the Ruston VTO 1 diesel stationary engine into action, after a suitable starting handle was sourced on ebay! It started relatively easily amidst lots of noise and smoke, and appears to be in very sound condition. I visited “Combine Fabs” at Danethorpe near Newark and purchased suitable metal sections to enable us to build a replacement grain pan and shaker shoe. The original is fragile and badly rotted, but will serve as a pattern. The rear trunk of the machine has now been lifted off and will be strapped to the now redundant engine trolley for ease of handling. It will be moved to Mick Wilkinson’s workshop in the New Year for restoration by replacing the rotten sections and removing the dents in the rear corner. We have found that some of the bearings in the elevators are worn and these will be replaced whilst the machine is dismantled. The threshing machine has now been put back inside the Barn as the central exhibit with the other exhibits rearranged around it, and looks much more impressive than previously. This will enable it to be more easily removed in the future. Various minor problems, discovered during the Heritage weekend, are in the process of being rectified so the machine will be in perfect condition for 2017. So far we have fitted a “new” piece of chain to replace the “old piece of bicycle chain” to raise the board above the straw walkers; made a new belt to replace one borrowed from “The Village” and repacked the bearing lubricators and fitted wicks as required. We have acquired a straw elevator from the Spalding area, which will complement our collection of vintage harvesting machinery. It is in good sound condition and was manufactured by the Maldon Iron Works in Essex probably in the early 20th century. It appears to be in sound original condition with very little work required before we can use it. We plan to place it in line with the threshing drum to convey the threshed straw to the baler at our next Vintage Steam Threshing event. A horse drawn potato ridger, which came from the Wainfleet area, has recently been donated. This is undergoing minor repair work and will be repainted in more appropriate colours over the winter months. Work has continued on the combine. We decided to remove the “trunk” at the back of the machine, which is made of mild steel and has corroded badly on its top surface. This entails removing many rusty nuts and bolts, which surprisingly have come out quite easily! The straw walkers have been unbolted and lifted out, which should make the job much easier. These are galvanized and hence in very good condition. Next to come out was the grain pan, which sits under the concave and moves the threshed grain back to the sieves. This is not in very good condition but should be repairable with a little ingenuity and improvisation! We will probably remove the grain and return elevators next, and then we can start on the repair work! The Vintage steam threshing event was approaching rapidly! The threshing drum borrowed for 2015 was no longer available, so our attention turned to our own R Hornsby drum in the Barn. This has been at the back of the Barn for over 30 years as a static exhibit and we believe that it was built in the early 1890s and possibly even earlier. Our local firemen came one evening and turned it round for us so we could recommission it. We had less than a fortnight to prepare it for work! We made up a complete set of belts as there were none with the machine. There was some considerable head scratching as we worked out which pulleys were connected to each other! Stiff bearings were freed off and thoroughly lubricated. Several pieces of corroded metal were replaced including making two new sieves with new perforated mild steel supplied very quickly at short notice by F H Brundle. Grant made repairs to a wooden housing which covers the elevator driving pulley and also made some safety rails to fit on top of the machine., and lots of debris was removed from the machine including a bar of soap and a piece of old bicycle chain ! The Heritage weekend was extremely wet on Saturday, but ten or so brave tractor drivers set off in dire conditions and returned wet and cold at lunch time. It was too wet for Stationary engines and only three vintage cars appeared. Sunday by contrast, dawned bright and clear and the weather was perfect for steam threshing. After everything was set up in the right position, our drum was tested for the first time in very many years with the first of our sheaves. We had a minor issue with the elevator where a piece of replacement metal sheet was catching on an elevator cup. The threshed straw was reluctant to flow up the walkers and blocked the area beneath the concave. On investigation we discovered a heavy hinged board above the walkers with the remains of a piece of bicycle chain attached! We quickly strapped this board up in the fully raised position and the problem was solved. The drum then hummed happily, swallowing our sheaves, driven by Gordon’s engine, chuffing steadily, for the rest of the day. The straw was baled up using Harold’s Jones wire tying baler powered by Mark and Williams’ steam engine. The combine was started up and demonstrated at intervals when the threshing crew took a well earned break. This is the first time we have demonstrated it publically, and it created great interest. The binder stood beside the combine providing an interesting contrast in harvesting machinery used over the last hundred or so years. There were many interested visitors throughout the day which, in the idyllic conditions that prevailed, must be judged to have been a great success – well worth all the hours and hard work of preparation! The following Monday was spent clearing up and putting the binder and combine back in their respective shelters. I took the opportunity to move the combine under its own power, which hadn’t been tried before! I positioned it in front of the shelter but daren’t risk driving it in as the clearances are very tight! I also tried out the hydraulic table lift, which worked perfectly. Whilst the threshing machine was still outside, we cleaned it out thoroughly, and then sprayed the inside and painted the outside with an insecticide to treat woodworm. The threshing machine will now be put back inside the Barn as a central exhibit with the other exhibits rearranged around it, so that it can be more easily be removed in the future. This has been a very busy month! Andy Thorndike has given Alford Manor House the four wheel trailer used for harvest 2015. To make it ready for 2016 harvest it was taken to Mick Dale’s workshop where he made some new “Gormers” to replace the rotted originals, and also made and repaired the detachable sides. The trailer then came to the Manor House where the wheels were removed and it was completely repainted in the original colour scheme of green with yellow wheels. Two new front tyres have been fitted, the rear iron drawbar has been straightened by Mick Wilkinson, and finally the parking brake has been repaired by replacing the wire cables. The trailer is now fully restored with most of the cleaning and painting carried out by Grant and Alec. The binder was checked over and serviced, with the canvasses given special attention ready for harvest 2016. We have designed and made a set of transport wheels using an “up cycled” car axle and wheels so that the binder can now easily be moved on the road without the need to use a low loader. Mick Wilkinson, once again, welded everything together, and the result has been very successful. On August 18th the binder, our newly refurbished four wheeled trailer, and Bill Read’s trailer travelled in convoy to Kevin Willoughby’s wheat field in Huttoft where the “gairings” had generously been left for us to harvest. This was quite quickly completed and James Howe of Tothby Manor then offered us the opportunity to harvest some of his wheat at Tothby! We gratefully accepted this offer and then proceeded to complete the second load of sheaves. The binder ran faultlessly apart from a very minor twine problem with the knotter. This enabled Gordon Martin to demonstrate hand tying sheaves using twisted straw. Bob Pick’s Grey/Gold Ferguson joined Alec’s and Grant’s Fergusons to provide a trio of vintage tractor power. Andrew Willoughby drove the binder tractor, and various other people took their turn at driving, loading and pitching sheaves onto the trailers. It was a wonderful day enjoyed by us all! Much progress has been made recently with the combine! The engine is now back in its rightful place, and fully connected up to the rest of the machine. Two weeks ago we connected a battery, primed the carburettor, pressed the starter button and the engine burst into life! To say that we were delighted is an understatement! There are a few minor problems still to sort out before we are able to move it under its own power, but we should be able to provide a running demonstration at the Heritage Weekend on September 11th. There is still quite a considerable amount of work needed to refurbish the threshing machinery before it can once again be used to combine a crop .We have, however, now recovered the original Registration Number and the machine is now taxed and ready for the road! The next big project is to remove our Hornsby threshing machine from the Hackett Barn and make it ready for September 11th! A purpose made engine trolley has been designed by Grant and built by Mick Wilkinson and now carries the Ruston VTO diesel engine enabling it to be moved into the engine shed. Tony Hogg will no doubt soon turn his attention to making this engine work again! The Combine engine was successfully started in situ this morning ! There are a few teething problems with some of the machinery, but it hasn’t been run for at least 30 years! We should be able to give demonstration start up and running at the Heritage Weekend. Lots of other (feverish) activity going on – fuller report in a couple of weeks – with photos! A postscript to the previous update ! The combine engine was successfully fitted today by the “barn” gang ably assisted by Grant and Robin and new barn volunteer “DK”! Grant has also made a new “pitman” arm from ash to replace the worm infested fractured original! Dave Kenney has tested the electrical equipment of the combine, and has found that the voltage regulator was in poor condition, as were the lighting switches. In addition, the starter switch was inoperative, so replacements have been sourced for these items, along with new cable and fuses for the lighting circuits. This work will be completed very shortly. The fuel system has been keeping me busy. The original fuel lines were steel, but this had corroded badly and fractured in several places, so it has been replaced with copper, and a new flexible pipe has been made up at the “engine” end. The tank itself is sound but has some sediment in which will be flushed out. The glass sediment trap is in good condition. The canvas linings to the mounting cradles were rotten and replacements have been made from spare binder canvas. The oil bath air filter was found to have rotted out due to an accumulation of water sometime in the past! A new Massey Ferguson replacement of very similar size and at very reasonable cost was sourced on the internet, and this has been painted to match the machine. The water pipes connecting the radiator to the engine have been cleaned, and one is badly corroded in two places. Luckily we have some suitable spare pipe, and Mick Wilkinson should be able to repair this easily. All the hoses will also be replaced as they are a little tired! The engine bay area is being cleaned down, “de- rusted” and repainted where necessary while it can easily be accessed. We hope to refit the engine in the next month. .Most of the belts are missing so we have measured up the quantity of belting required to drive the various pulleys . We have discovered that a repair is required to one small pulley which was obviously damaged many years ago and has a historic repair that has failed. Another job for Mick! Grant Allan has successfully master minded and coordinated a team effort to straighten the chassis of our Massey Harris 780 combine harvester! The plan started with moving the combine from the shelter to prevent the possibility of fire damage. The rear steering axle was removed after the machine had been securely jacked up, and the angle iron bracing struts were the cut off using an angle grinder and other welds were cut through on the vertical plate. A box section was clamped to the un bent section of the main chassis member, and heat from a kiln burner , borrowed from Michel Ducos, was applied underneath the bent section. Other heat was applied from above using Mick Wilkinson’s gas torch. It then proved relatively simple to pull the bent section towards the box section using a combination of “G” clamps, large Stillsons, and a sledge hammer! The angle iron sections were heated by Mick and beaten back into shape on the anvil from our Blacksmith’s Shop. Mick the proceeded to weld the straightened angle iron braces back into position and reweld the vertical plate using Grant’s Mig welder. This he managed successfully despite the fact that it was somewhat smaller than his own three phase welder. When things had cooled down, the steering axle was reattached, the blocks and jack removed, and the combine pushed back into its shelter with Grant’s tractor to avoid the forecast rain. The improvement in the appearance of the machine is enormous and the stress in the frame caused by the bend has been removed. Dave Kenney (DK), a newly retired helicopter technician, is going to replace the wiring, check the electrical equipment, and also examine and service the hydraulic system. The next major project is to refit the overhauled engine into the combine…………..! Tony Hogg has started to refurbish the Lister “D” engines donated by Peter Snell and return them to pristine condition. William Weed, who has loaned the First World War Naval Uniform for the Alford Manor House Exhibition, has donated some binder canvasses which have been in the rafters of his barn for many years! These were from a Massey Harris binder identical to ours, and I hope to be able to refurbish them to provide a spare set. The beet plough and two cultivators have now been repainted and are back on display. The Thompson Millwrights Sail Trolley is now on display in front of the binder shed, along with a huge pattern for a “wind shaft” which is inside the binder shed. The pattern needs two men to lift it so goodness knows how heavy the casting must have been! The Barn has been reorganized by moving the Stationary Engines into the redecorated Coach House stables. This has made more room in front of the threshing drum which was an area that had become rather crowded! The Combine engine has been moved, on its trolley, into the Barn prior to its reinstallation into the Combine. Since last month the starter motor, which was found to be “lazy”, has been cleaned and rebuilt with some new brush springs. It was very dirty inside and the springs were very badly corroded and broken. Once reassembled it turned the engine over with ease. Just before Easter Tony Hogg decided that the time had come to test the engine! The results were spectacular as no exhaust was fitted, but it quickly started and ran reasonably well but was very noisy and initially smoky! Some of us missed this epic event, so it was repeated, with a makeshift exhaust fitted, a week later! It seemed to be “missing” on one cylinder for no apparent reason, but eventually on checking the firing order, two plug leads were discovered to have been transposed! Once corrected, the engine ran beautifully with a very smooth exhaust note! This was extremely gratifying and marked the culmination of six months’ effort to transform a “seized” inoperative engine into a fully functioning unit ready to perform its duties once more. Tony Hogg in particular is to be congratulated! The next challenge will be to straighten the rear of the chassis of the machine that was bent in a previous existence. We reopened on February 16th so much time has been spent on spring cleaning the Barn and removing leaves from the Cart shed etc so that we are ready for our visitors. The Coach House painting is now finished, and it has been swept out. Tony Perkins has made a very good job dealing successfully with a lot of loose and flaky paint! We will shortly be ready to start moving in some of the Stationary Engines. Brian Middleton has been working hard with saddle soap and metal polish to restore various items of harness which had been in need of some tlc. They are now gleaming and the leather is soft and supple. We’ve been very fortunate to acquire the original log book for the Combine, plus an operator’s manual, from the Lincoln Museum. This shows that the machine was first registered in August 1957 to a farmer in Billinghay. After 10 years or so it moved to Stickford Fen before ending up at Habertoft, near Alford 5 years later. We are delighted that we now know the full history of the machine, which differs a little from what we previously believed! The combine engine is now virtually fully assembled after a lot of time consuming work. We were delayed a little because of the need for some extra work on the valve seats. We have fitted an adaptor obtained from Austin County Spares, to enable us to fit a modern oil filter, because the original type is now unobtainable. The carburettor, petrol pump, and all the ignition system have been overhauled, renewed where necessary and refitted. Yesterday we connected the starter to a battery and turned the engine over to check all was well. After a few anxious moments with no oil pressure, it all started to flow strongly, and Tony Hogg was a happy man! We hope to refit the engine some time after Easter, but plan to replace the wiring first. This will be much easier without the engine in place, and Robin Walker is looking forward to the challenge! The new main spar has been fitted to the binder. This has had the effect of pulling the whole structure back in to shape so that the machine should run much more efficiently in future. I had not realized just how distorted the old spar must have been ! After a set back with the combine engine refitting, excellent progress has been made this week. We discovered that our new piston rings were thicker than those fitted because it seems replacement pistons had been fitted in the past. Our good friend Keith Moores machined the grooves of the pistons and the rings then fitted perfectly! This obviously caused a delay and more dismantling and reassembly work, but Tony Hogg has now replaced all the pistons and the sump is back on. The next job is to reassemble the valve gear. A new main drive belt is being made for us using the very frayed original as a pattern, by Vulcatech of Kings Lynn. A new governor belt and a hydraulic pump belt have also recently been purchased. We now have a complete set of new belts. Tony Perkins has undertaken the tedious task of redecorating the Coach House stable ready to move the Stationary Engines into in the spring. He has had to remove lots of old flakey paint work and stabilize it before repainting, but the effort has been very worthwhile. I have been painting the horse plough and the potato lifter, both made by Ransomes, following their shot blasting last autumn and tidying up one of our wooden framed ploughs. We have several other pieces of similar equipment at the shot blasters, so there’s plenty to do! Peter Snell has gifted two Lister D Stationary engines and a trolley to the museum following the recent death of his brother Michael. These engines were both used on the family farm at Farlesthorpe, one being used as a standby engine to drive a vacuum pump for the milking machines, and the other to drive a straw elevator. Peter had restored these a few years ago, and we are delighted to add these to our expanding collection of these engines. Tony Hogg had both of these running within a couple of hours after a little tinkering with the magnetos! Good progress has been made with the reconditioning of the combine engine. It was decided to replace all the piston rings, big end shells, and valves to put the engine back into the best possible running condition. Finding these parts has not been easy, but eventually I made contact with Brian Hayes of GBH spares in rural Devon and he was able to supply them all. Tony Hogg has started the reassembly process. The pistons complete with con rods have been removed and the new piston rings fitted. The bores have been cleaned up ready for refitting the pistons. There was considerable pitting to the valve seats, so the cylinder head was taken to Steve Waite and he has re cut the seats so the new valves should now seat satisfactorily. Grant has taken the water pump to his workshop to rebuild. The bearings were obviously badly worn and needed replacing. I have started the messy process of cleaning a great deal of oily sludge from the sump. This has uncovered a small area of rusted “pin holes” which will have to be repaired before refitting. The strained fitted around the oil pump was badly choked up, and this has now been thoroughly cleaned. Brian Middleton has rebuilt the wheel of the Gower of Market Drayton turnip seed drill using new spokes made by Grant. It is now sound again and runs “true”. This drill was acquired from the Riggall collection in 2013. Tony Perkins has cleaned and renovated the Hopper ladies bicycle retaining all the original paint work. This is now ready for the display. Grant has made a new main spar for the binder from ash to replace the original worm eaten item that fractured in August. I have painted this and am now putting all the fittings onto it prior to refitting to the binder. This should complete the restoration of the binder, and ensure it is in good working order for harvest 2016! 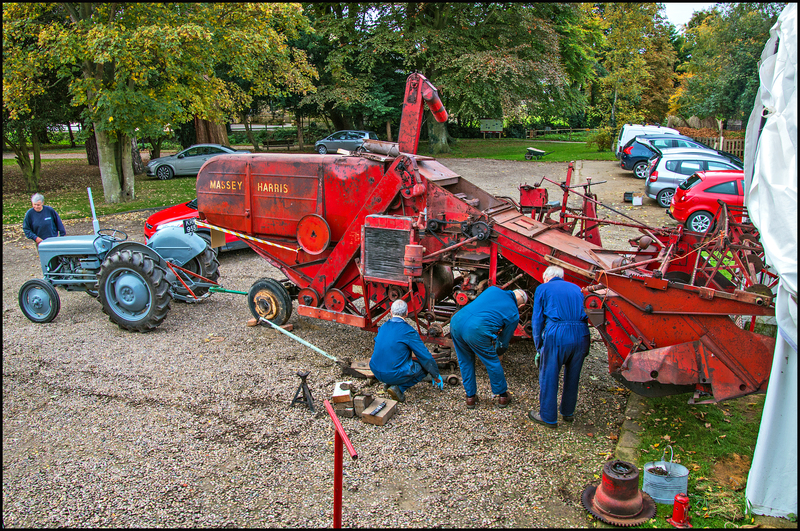 The main event this month as far as the Hackett Barn is concerned is that the volunteers and friends have managed to successfully remove the engine from the Massey Harris combine! We were able to borrow an engine crane from Harold Smith, and following the procedure described in an original workshop manual ( purchased on Ebay) the removal was relatively simple! The engine was transferred directly onto a purpose built trolley, whose design was based on an illustration in the workshop manual, and was fabricated by Mick Wilkinson (from a recycled market stall), earlier in the year. The engine was then easily transferred to the Coach house for overhaul. Tony Hogg was unable to resist the temptation to start dismantling it immediately, and in less than 2 hours had removed the cylinder head! This has revealed that water entry has seized the piston in number one bore, but at the moment the damage doesn’t look too extensive. We will work on it over the winter aiming to restore it to running condition . It will then be put back into the combine in the spring. Having removed the engine, the hub and wheel were replaced on the combine and it was put back in the shelter . Grant used his Ferguson tractor to move the combine. We have been able to acquire, at very reasonable cost, a number of “new old stock” driving belts which will help considerably with the long term restoration of the machine. The Heritage weekend of 12-13 September was a very busy time for Alford Manor House. The weekend started with the Tractor Run on a rather damp Saturday morning. 13 Classic tractors took part in the run, although the total number of tractors attending was close to 40.The tractors returned at lunch time, by which time the rain had stopped. There was a large collection of working Stationary Engines on display, including 6 of our barn engines, all recently restored by Tony Hogg. He was kept very busy trying to keep them all running simultaneously! We had an interesting collection of pre war and classic cars on display as well as 3 steam engines and a Foden steam lorry. On Saturday evening the “drum” and baler were set up and positioned by Mark Riggall using his splendid Marshall tractor – a type of tractor very popular with threshing contractors in the past. Sunday 13 was fine and dry, and perfect for our steam threshing demonstration, using the sheaves made in August by our Massey Harris binder. The “ Drum” was a Clayton and Shuttleworth dating from 1898, on loan from Mr Sanderson of Croft , and was powered by Gordon Smith’s steam engine. The “Drum” was manned by barn volunteers. The straw was baled using a wire tying baler owned by Harold and Gordon Smith, and powered by Mark Riggall’s steam engine. The whole weekend was a great success with many visitors on both days. The Hackett Barn volunteers were also kept very busy showing visitors around . The Threshing Day would not have been possible without the help and generosity of so many people but in particular Kevin Willoughby, the Skinner family, Harold and Gordon Smith, Mark and William Riggall, Andy Thorndike, Roy Sanderson for lending the “Drum” and Bill Read for moving it. We hope to repeat the experience next year and use our own Hornsby “Drum”. Work on the combine has resumed, and the engine is now completely disconnected at both ends, and ready for a suitable opportunity to remove it for renovation over the winter. The dynamo has been overhauled, and a cylinder head gasket obtained from a stockist who has other engine spares available. Roy Wilson, who sold the combine to the Dales family of Mumby in 1960 when he was manager of Burgess in Alford, has generously supplied a number of “new old stock” driving belts at very reasonable cost. We are delighted with these, as many of the existing belts on the machine were in a very poor condition. Mick Wilkinson has repaired the wheel of our horse drawn “skuffle” and freed off two of the legs which were incorrectly fitted. We have recently acquired a Hopper “sit up and beg” ladies bicycle in very original condition, and also a 1943 BSA “airborne” folding bicycle. This was designed to be dropped from the air for the use of paratroopers during the Second World War. The weather was favourable this morning, and the crop was dry so we made our attempt to use the binder. We had a few initial problems with the twine supply to the knotting mechanism, probably because of lack of use for the past fifty odd years! The combined expertise of Brian Middleton and Richard Willoughby eventually solved the problem, and we managed to produce a waggon load of sheaves with little further trouble. We now have enough sheaves to enable the steam threshing demonstration to go ahead at Alford Manor House on September 13th. We owe a great debt of gratitude to the Willoughby family, without whom this exercise would have been impossible, Mr Thorndyke for the loan of the harvest waggon and the Skinner family for providing storage and the use of their facilities. We also had quite a large audience of retired local farmers who seemed to be enjoying the spectacle of vintage harvesting! A second Lister D engine from the Len Taylor collection has now been restored to working condition by Tony Hogg. The ignition system was reconditioned with a new plug, points and condenser. The horse drawn potato lifter plough has been repaired By Mick Wilkinson. He freed off the wheels, and replaced part of the share. It has now gone away to be shot blasted prior to painting. The newly acquired steel framed horse plough has had the handles repaired and it too has gone to be shot blasted to remove the many layers of flaking paint and rust! The wheel of our turnip seed drill, acquired from the Riggall collection in 2013, is being respoked to replace those that were rotten and worm eaten. Grant Allan has manufactured the spokes and these are being fitted by Brian Middleton. The engine trolley made by Mick Wilkinson for the Massey Harris combine harvester, is now complete, and ready for when we are able to remove the engine. A new hard wood bearing has been made for the grain discharge auger of the combine by Grant Allan, but not yet fitted. Progress on the combine has temporarily slowed as effort has been diverted to the binder. Much effort has been expended in renovating the three canvasses of the Massey Harris reaper binder. We now have a working set which have been placed on the machine. I am grateful to John Mowbray of Friskney and Trevor Kerfoot of Gosberton for donating old canvasses which have provided an invaluable source of spare straps, battens and canvas to repair the ravages of mice, woodworm, and old age to our original canvasses! New balls of sisal binder twine have been purchased, and the knotting mechanism has been tested by Brian Middleton and pronounced to be in working condition! Two knives came with the machine, and both seem to be in good condition. One has been installed and appears to work correctly. With a few minor adjustments, and keeping fingers firmly crossed, I think we are ready to go harvesting! Grant Allan has been very busy working in the back ground producing stationary engine trolleys for our expanding collection, which will include two on a long term basis of his own. These are a Petter 1A with vacuum pump, and a Lister D which came originally from a cement mixer, and runs in the opposite direction to most engines. Needless to say, Tony Hogg is the mechanical genius at work to restore these! All our volunteers have been busy showing visitors our expanding collection of bygones and artefacts. They are invariably most appreciative, and someone today remarked that” it was the best £1 I’ve ever spent”! The interior layout of the museum has been re organized to accommodate the growing collection of Stationary engines. Our own Petter A1 engine was restored to working condition last year by Tony Hogg. In late summer 2014 a Lister D petrol/ TVO, and a Lister D “Shallowwell” pumping set were acquired at the Don Gilbert Farm Sale at Firsby. These were both complete but in non working condition. Over the winter months Tony Hogg has overhauled , re conditioned and repainted them and they are now fully operational and very smart. In the last month, we have been fortunate to acquired, on a permanent loan basis, 4 more Stationary engines, from Len Taylor. These are a 5.5 hp Ruston & Hornsby Diesel, 3 Lister D engines ( one incomplete) and a free standing Shallow well pump. One of these engines is in working condition, and Tony Hogg has started work on one of the others. Our Massey Harris 780 Special combine harvester, which had been in open storage at Bilsby for several years, was moved to the Manor House site in November last year. A restoration fund has been made available, which has enabled us to purchase and erect a shelter over it. This was achieved in late January. We have now been able to start to conserve it and commence restoration. The treatment of the surviving paint work with linseed oil has already considerably improved the general appearance of the machine and will help preserve it. To date, repairs have been carried out to the “pick up reel. 3 wooden spokes which had fractured and/or were worm eaten, have been replaced and the reel straightened. The radiator air screen , which had become quite badly corroded and was seriously weakened as a result, has been repaired and rebuilt. It is now being repainted as virtually all the original paint had disappeared. The grain tank has been straightened out and substantial repairs carried out to replace perforated metal. It will be repainted where necessary in due course. A new pulley flange for the discharge auger has been made by a retired engineer in Friskney. This is a beautiful piece of machining and replaces the original shattered casting which would have been extremely difficult to repair satisfactorily. The internal machinery of the combine is all “free” and functioning. The engine, despite several treatments with Diesel into the cylinder bores, has remained seized, and will have to be removed to enable it to be worked on. An engine trolley is being constructed, from recycled materials, and a set of donated wheels, to enable the removed engine to be moved and overhauled. This will be carried using the expertise of volunteers. The Massey Harris reaper binder, purchased in the dispersal sale of Riggall’s artefacts 2 years ago, has now been almost completely restored. Work is taking place to make up a set of sound canvasses from those that came with the machine, and some others donated by a local farmer. The intention is to produce some sheaves of wheat with our machine, to be used for a threshing demonstration at the Heritage weekend in September (12-13) 2015. We have been offered access to a wheat field by a generous local farmer. A single furrow horse plough has been donated very recently to the Hackett Barn, and is now on display.